Assistant Prof. Maytal Caspary-Toroker studies potential solar energy conversion materials such as the conversion of water and carbon dioxide to fuel. 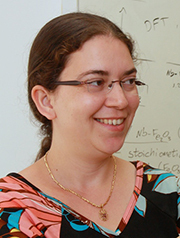 She specializes in using computational and theoretical tools mainly quantum mechanics to study and characterize the properties of metals and semiconducting materials, specifically metal-oxide materials, which will better absorb solar energy and convert energy and chemicals into electricity and fuels. She is exploring the reactivity of new materials in photoelectrochemical cells that will effectively produce fuels including hydrogen, methane, methanol, and formic acid. Toroker joined the Department of Materials Science and Engineering as an Assistant Professor in 2013 and a member of the GTEP-led I-CORE solar fuels program. As part of her lab she oversees the use of some 400 computer processors by remote access centralized in the basement of the Faculty of Computer Science that provide her with sophisticated calculations of the different arrangement of layers, specifically the water layer and interface. She has several dedicated MA and senior undergrad students, and collaborates with professors from other faculties, as her findings are often applicable to many different research directions and opportunities. Over the years she has received several prestigious academic awards including the L’Oréal-Unesco-Israel Award (2010), the New England Fund (2009), and others.